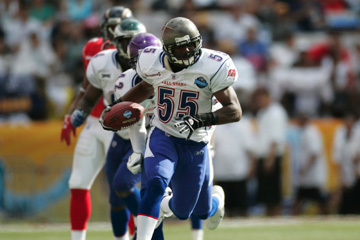 NFC linebacker Derrick Brooks ran 59 yards for a touchdown after intercepting AFC quarterback Trent Green. It must be tough to be on offense in the Pro Bowl these days, since it looks like they play defense in this game now. Sometimes. Occasionally. In spurts. And so offenses -- leisurely walk-throughs plus unfamiliar faces equals timing that is less than precise -- are left to wonder when they're playing in Pro Bowl mode ... or when the guys on the other side of the line are coming at them full speed, hitting hard. We saw that in the third quarter with more forced passes, all over the place and off-line. We saw the AFC's Casey Hampton sack Jake Delhomme, with Hampton's teammate and fellow defensive tackle Marcus Stroud stealing the ball for the AFC when it bounced right into his arms. But the AFC offense was having fits of its own. NFC linebacker Derrick Brooks intercepted Trent Green and was gone. Green had a man in his face on a bootleg gone bad. Brooks cut in front of Antonio Gates, made a move on Green, and the NFC had a 17-10 lead. Later, the NFC's Shaun Rogers bull-rushed Green, and buried him. 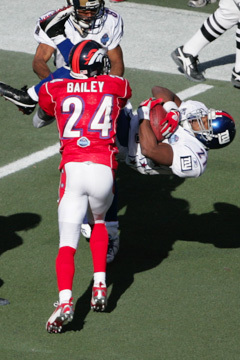 Denver Broncos cornerback Champ Bailey, of the AFC, upended New York Giants running back Tiki Barber, of the NFC. It's rough on offense in the Pro Bowl, these days. Just when you thought it was safe -- the NFC would strike with a Santana Moss end-around run for 18 yards -- the AFC's Bob Sanders nailed Moss with an unexpectedly hard hit near the sideline at the end of the run. (This is the Pro Bowl?) The ball popped out, and Champ Bailey picked it up. Yes, they play D, now. But in spurts. At last, someone moved the ball. Green threw one to Chris Chambers, who made a nice catch behind him, 18 yards. Then, Larry Johnson went off-tackle for 20 yards -- he went 15 yards before he was touched. The quarter ended on the 18-yard-line. Johnson rocking, the AFC knocking, still down, 17-10. AFC STANDOUT: Defensive tackle Marcus Stroud, who not only recovered a fumble, but pressured NFC quarterback Jake Delhomme into a near-interception on third down early in the second half. NFC STANDOUT: Linebacker Derrick Brooks, and the entire NFC defense. But it was Brooks who stole a Trent Green pass and took it 59 yards for an emphatic touchdown. STAT CHAT: The AFC defense held the NFC to 13 yards rushing in the quarter. That includes wide receiver Santana Moss' 18-yard end-around run. Running back Tiki Barber was stopped for a 2-yard loss and running back Warrick Dunn had one run for minus-3 yards.